One vital element to any wildlife habitat is a dependable source of clean water. Like most of the western United States, the FHL dry season results in water scarcity that causes stress and mortality to wildlife. FHL averages about ¼ inch of rainfall between June and September. To improve the habitat for wildlife, FHL maintains over 40 wildlife guzzlers. "Guzzlers" are artificial watering holes providing year-round water to thirsty wildlife. This is especially important during the hot, dry months of summer and early fall when lack of water can cause wildlife to leave areas that would otherwise suit their needs. Guzzlers can come in all kinds of shapes and sizes but they share three basic components: a collector or apron, a storage tank, and a distribution system or "drinker". Quite simply, guzzlers catch and store rainwater making it available during drier times of the year. Although the system is very basic, it requires routine maintenance, such as cleaning aprons of leaf litter to reduce organic waste buildup in the tanks, unblocking clogged pipes, and clearing adjacent vegetation to prevent damage from fires. Regular maintenance ensures that they work properly and maximize their economic life. Your FHL hunting permit fees make this possible. Built primarily to benefit big game and upland bird species, guzzlers also provide a valuable water source for wildlife of all types and sizes. In 2013, FHL identified the need and locations for additional guzzlers. The FHL Roads and Ground crew assisted by digging the holes for the 450 gallon tanks. Utilizing funds from FHL hunting permit sales and a $1,240 grant from the Rocky Mountain Elk Foundation, we were able to install three more guzzlers in the hunting areas. 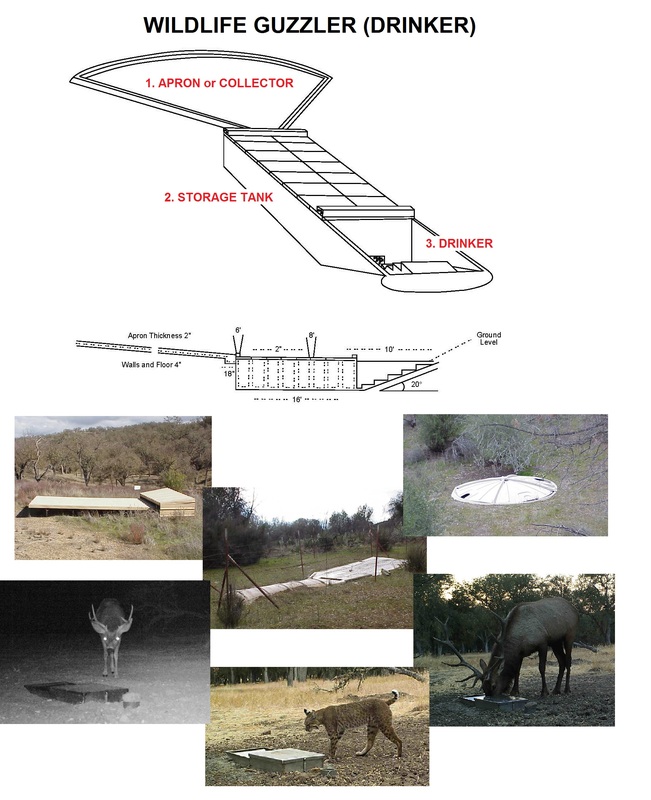 In addition to providing supplemental water sources for wildlife, these new guzzlers also reduce the likelihood of large mammals being drawn off post to artificial water sources on adjacent agricultural lands and the irrigated crop damage that can result. See FHL guzzlers in action. Download the videos (mp4 format) below. We don't tell folks where the guzzlers are. Like game that's something you need to find on your own.